Length N/A 23" 23.5" 24" 24.5"
Show off your hips with this dress. Soft gathers are brought together with an edgy zipper along the front of the left leg, emphasizing the curve of the hips and backside. 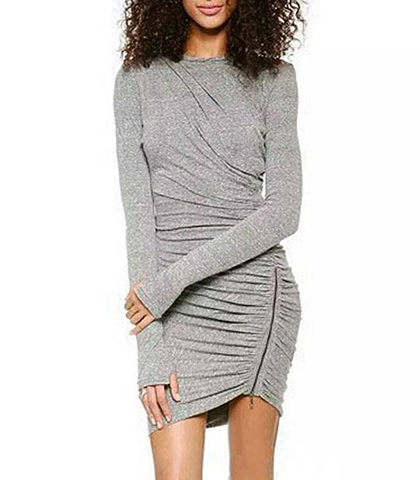 The sleeves are extra long with thumb holes, giving you a tough of functional fashion that keeps those sleeves from bunching up and getting in the way of the design of the dress. This dress is offered in light grey, and is available in sizes small to extra large.